In bowl, cut chilled butter through flour mix with two knives until small pea sized pieces are formed, or use paddle attachment on mixer. Slowly add water until dough comes together, not sticky. Add additional water if dough is too dry. Do not over-handle dough. Divide dough in half and roll out between two sheets of parchment or plastic wrap, until about 1/8" thickness. For pre-baked crust: This crust is perfect pre-baked and then filled with pudding, fresh fruit or your favorite filling. Pre-heat oven to 350° and bake unfilled crust on bottom oven rack for 28-30 minutes. For pies that bake with their crust: Fill unbaked crust with your favorite filling (quiche, pumpkin pie, apple pie filling, etc.) and bake following your pie recipe directions. Freezing: Dough can be frozen for later use, wrap in plastic and freeze. Thaw completely to use. This is from the TV show Mom's Cooking. Mix flour and sugar until well-blended. Pour in 1 cup cold milk and mix to make batter. Heat skillet on medium high, then melt butter. Pour batter into cast-iron skillet. Pour blackberries and juice into middle of pan; do not stir. Microwave chocolate and butter in large microwaveable bowl on HIGH 2 min. or until butter is melted. Stir until chocolate is completely melted. Stir in sugar. Blend in eggs and vanilla. Add flour and nuts; mix well. Pour into prepared pan. From the Baker's chocolate package. This is my maternal grandmother's recipe. Combine all ingredients except cornflakes and nuts in mixer. Stir in flakes and nuts by hand. Drop by cookie scoop onto baking sheets. Bake for 10-12 minutes. Cool. Store in an airtight container. This is my sister's version of a recipe that our great grandmother Bennetsen used to make. Melt chocolate. Combine with brown sugar and oil in a bowl. Add eggs, beating well. Add vanilla. Add dry ingredients. Stir in walnuts. Shape dough into balls and roll in powdered sugar to coat. Place on baking sheet and bake until cookies crack and cracks no longer look wet, about 10 minutes. Do not overbake. Combine all ingredients and pour into 9"x9" pan. This is our family's recipe for Fattigman, or Scandinavian "poor man's cookies". They are somewhat labor intensive; the dough must be rolled very thin and carefully shaped for deep frying. The house will stink of frying oil for days afterwards but the taste and delicate texture are well worth it! Beat egg yolks. Gradually add sugar. Add remaining ingredients and mix until combined. Wrap dough in plastic and refrigerate. Meanwhile heat the oil in a large pot or kettle to 370° F.
When oil is almost ready, roll the dough very thin -- approximately 1/16" thick (this works really well with a pasta machine). Using a sharp knife, cut dough into elongated triangles or diamonds. Cut a small slit in center of each piece and carefully pull one corner though the slit. Deep fry dough pieces at 370° F until lightly golden brown, about 2-3 minutes. Remove with slotted spoon and place on paper towels to cool slightly. Sift powdered sugar over the tops of the cookies. Store in an airtight cookie tin for up to 2 weeks. On a lightly floured surface, roll dough to 1/8 inch thick and transfer to a 9-inch deep dish pie tin. Fold edge under about 1/4"-1/2", fluting the folded edge as you go. Chill for at least 30 minutes. 2. In a medium bowl, whisk together sugar, butter, eggs, corn syrup, golden syrup, maple syrup, bourbon, and vanilla. Fold in the chopped pecans. Pour filling into pie shell. Arrange pecan halves on top of pie. 3. Bake 15 minutes at 400 degrees, then reduce heat to 350 degrees and continue baking for about 1 hour 15 minutes (a knife tip stuck into pie should come out clean). Serve warm or at room temperature, garnished with whipped cream. The sugar cookie is a timeless classic that may be customized to your liking. Here I used sanding sugar on half of the batch, and snowflake sprinkles on the rest. In a large bowl, cream together butter and sugar using an electric mixer until light. Add eggs, vanilla and almond extracts and beat until smooth. In another bowl, mix together flour, baking powder, salt and cinnamon (if using). Add flour mixture to butter mixture and beat until smooth. Scrape dough onto a sheet of plastic wrap and flatten into a disk shape. Wrap up and refrigerate for about an hour, or until firm. Pre-heat oven to 375° F. Line baking sheets with parchment paper or Silpat® mats. Divide dough into 4 equal portions. Hint: work one chunk of dough at a time, refrigerating the other pieces until you are ready to use them. On a lightly floured surface, roll out a chunk of dough to 1/8-inch thickness. Cut into shapes using cookie cutters. Place on prepared pans and sprinkle with sugar (if using). Otherwise, bake them plain and ice them when cooled. Bake 6-8 minutes or until light brown at edges. Transfer to wire racks to cool completely. Store plain or sugar-topped cookies in an airtight container for up to 2 weeks. Store iced cookies between sheets of waxed paper in an airtight container for up to 4 or 5 days. Sift powdered sugar into a bowl and add hot water, corn syrup, and vanilla. Blend until smooth. If necessary, add a little more hot water to achieve desired consistency. Spread icing over cooled sugar cookies. If desired, sprinkle sugar crystals over icing. Let cookings stand until icing sets up. These finger-shaped cookies are blanketed with powdered sugar like a thick layer of snow. Their taste is similar to that of Russian Tea Cakes. Unlike most cookies, these bake slowly (about an hour) at a very low temperature (250° F). Pre-heat oven to 250° F. Line baking sheets with parchment paper or Silpat® mats. Using a food processor or blender, finely grind the pecans with 1 Tbsp of the powdered sugar. Place the remaining sugar in a medium-sized bowl and, using the tip of a sharp knife, scrape the seeds of the vanilla bean into the sugar. Add butter. Cream together butter and sugar mixture until light. In another bowl, combine flour, ground pecans and salt. Add to butter mixture and beat until blended. Spoon out rounded teaspoonfuls of the dough and shape into logs about 3/4-inch wide and 1 3/4-inch long. Place on prepared pans and bake for 50 to 60 minutes or until very light brown. Carefully transfer to a wire rack to cool for a few minutes. Dust a sheet of waxed paper with powdered sugar and transfer cookies to it. Sift more sugar over the tops of the cookies to coat completely. These German "peppernut" cookies are absolutely divine. I love anything with cardadmom and cloves! This recipe calls for ground raw almonds or skinned, toasted hazelnuts; I used the hazelnuts and kept them whole. Keep in mind that the dough must be refrigerated overnight. In a large bowl, using an electric mixer, cream together the butter and brown sugar (and molasses, if applicable) until light. Add the honey and egg, mixing until combined. In another bowl, combine dry ingredients (flour, powder, soda, salt and spices) with the nuts. Blend flour mixture into butter mixture. Shape dough into a ball, wrap in plastic and referigerate overnight. (Next day) Pre-heat oven to 375° F. Line baking sheets with parchment paper or Silpat® mats. Roll dough into 3/4-inch balls using your hands. (Try using a small cookie scoop to make your cookies all the same size.) Place on pans about 1 inch apart and back for 8-10 minutes, or until light brown. Transfer cookies to wire racks. As soon as cookies come out of oven, prepare the glaze. In a small bowl, stir together the powdered sugar and Cognac. Add a few drops of water as necessary to reach a glaze consistency. Drizzle or brush the glaze over the still warm cookies, and allow to cool completely. Store cookies between layers of waxed paper in an airtight container for up to 3 weeks. These are thin, crisp, Scandinavian spice cookies. Simple and delicious! In a large bowl, using an electric mixer, cream together the butter, sugar, corn syrup, egg, baking soda, salt, cinnamon, ginger, allspice and cloves until smooth. Stir in flour. Scrape out the dough onto a sheet of plastic wrap. Use the plastic wrap between your hands and the dough to flatten it into a disk (this helps keep the dough from melting too much). Wrap and refrigerate for about a half hour or so, until firm. Preheat oven to 350° F. Line baking sheets with parchment paper or Silpat® mats. On a lightly floured surface, roll dough to 1/8-inch thickness and cut into shapes using cookie cutters. Transfer to lined baking sheets and back 10 minutes, or until light brown. Transfer to wire racks to cool. May be stored in an airtight container for up to 2 weeks. This is my mom's recipe; it makes an elegant finish to Thanksgiving or Christmas dinner. My mom adapted it from a recipe in the original Joy of Cooking. Beat egg yolks until light. Gradually beat in sugar. Place gelatine and water mixture in a saucepan over low heat; stir until gelatine is dissolved and mixture is warm. While beating egg yolk mixture constantly, slowly pour gelatine mixture into it in a steady stream. Cool slightly. Stir in the rum. Whip heavy cream until stiff, and then fold into the gelatine mixture. Cool completely, but before it begins to set pour it into the prepared crust or shell. Chill pie in refrigerator until set. Garnish with grated bittersweet chocolate and shaved pistachios. Serve well-chilled. The original recipe called for 1 Tbsp gelatine with 1/2 cup cold water. However my mom has found that the pie sets up better by increasing the gelatine-to-water ratio. She accomplishes this by either (a) decreasing the water to 1/4 cup, or (b) increasing the gelatine to 1 1/2 Tbsp. My mom has made this recipe for as long as I can remember. It is simple and easy, yet elegant and delicious. This pie makes a nice addition to pumpkin pie at Thanksgiving. In a double boiler melt together chocolate bars, marshmallows and milk. Allow to cool. Whip cream until stiff peaks form. Fold into cooled chocolate mixture, folding gently until evenly mixed. Pour into graham cracker pie shell. Optional - whip additional 1/2 pint cream and serve with pie. I was looking for something to make with some bittersweet chocolate chips I had in my pantry. This recipe from Ghirardelli piqued my interest. Let sit a few minutes and then sprinkle chocolate over toffee. 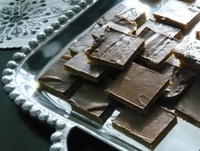 Once chocolate melts, spread in an even layer over toffee. Sprinkle sliced almonds on top. Freeze until chocolate sets. Once the chocolate is set, break into pieces. This recipe can be found on the Ghirardelli natural unsweetened cocoa package. I made up my own frosting recipe because I like the tanginess of sour cream and cream cheese in my chocolate frosting. Preheat oven to 350F degrees. Grease and lightly flour two 9-inch round cake pans. In a medium bowl, combine flour, cocoa, baking powder, baking soda and salt; set aside. In bowl of stand mixer, cream butter and sugar on medium-high speed until light and fluffy -- about 4 minutes. Reduce speed to low and add vanilla and eggs, one at a time, scraping sides of bowl after each addition. Alternately add flour mixture and milk (starting and ending with the flour mixture), while mixing on low speed. Continue to mix until smooth. Pour cake batter into prepared pans. 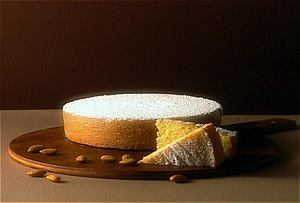 Bake for 30-35 minutes or until a cake tester inserted in the center of cake comes out clean. These are surprisingly easy to make. Preheat oven to 325F. Line a large cookie sheet with parchment paper and set aside. Combine coconut, sugar, flour and salt in a bowl. Stir in the egg whites and vanilla. Drop mixture by teaspoonfuls onto prepared cookie sheet. Bake for 20-25 minutes or until edges are light brown. Transfer to a wire cooling rack and allow to cool. Optional - Melt 4 oz semi-sweet chocolate with 1 tsp. shortening. Dip bottoms of cookies into the chocolate, or drizzle chocolate over tops of cookies in a criss-cross pattern. Adapted from The New Better Homes and Gardens Cookbook. This recipe is a classic. Place shortening and peanut butter in mixer bowl and beat on medium-high speed until smooth. Add 1/2 cup sugar plus brown sugar, baking powder, and baking soda. Beat until combined, scraping sides of bowl with a rubber spatula occasionally. Beat in egg, milk, and vanilla. Beat in the flour; dough will be stiff. Shape dough into 3/4" - 1" balls. Roll in the additional granulated sugar. Place 2" apart on an ungreased cookie sheet. Bake for 10-12 minutes or until edges are firm and bottoms are light brown. Remove from oven and immediately press a chocolate into center of each cookie. Transfer to a wire cooling rack to cool. Another simple recipe that you can modify to your liking. Combine first 5 ingredients in a large bowl and set aside. Pour white chocolate over cereal mixture and stir to combine thoroughly. Drop by spoonfuls onto waxed paper. Allow to harden, and then store in airtight container. This is very easy and makes a delicious fudge. Generously butter an 8" square pan and set aside. Melt chocolate in the top of a double boiler over hot, not boiling, water. Remove from heat and stir in remaining ingredients. Spread in prepared pan and chill for 2 hours or until firm. Turn out onto a cutting board and cut into squares. Store in tightly covered containers in the refrigerator. This recipe is extremely simple. The only tricky part is dipping in the chocolate since it can be somewhat messy. Combine first 4 ingredients. Form into 3/4" - 1" balls. If mixture is too sticky place in refrigerator or freezer for several minutes until of firmer consistency. Melt semi-sweet chocolate chips or other dipping chocolate. Dip each ball in the chocolate, covering completely. Work quickly so peanut butter centers do not melt in the chocolate. These cookies are a favorite in my family. I remember my mom's aluminum cookie press with the crank on the top; I'd sit and watch my sisters as they created wreaths and trees from the dough and sprinkled it with colored sugar. We omitted the almond extract because of my dad's dislike of it, but now that I have a family of my own I put it in because I like it. Cream butter and sugar together until light; add eggs and flavorings. In a separate bowl, sift flour with baking powder and salt. Add to butter mixture and mix thoroughly. Form dough into a log, diameter slightly smaller than the diameter of the cookie press (if dough is too soft, refrigerate until firm. Insert log into cookie press, breaking off when filled, and close/secure press. Force dough through the cookie press onto ungreased baking sheets (butter cookies do not require greased baking sheets). Sprinkle lightly with colored sugar, if desired. Bake for 7-10 minutes or until slightly golden. Do not brown these cookies; they should have a delicate golden color. I made this twist on the classic Pecan Pie for this year's Thanksgiving feast. It turned out beautifully and looked just like the picture in my Cooking Light Magazine. Yum. Combine first 10 ingredients, stirring well with a whisk. Stir in pecans. Roll dough into a 13-inch circle; fit into a 9-inch removable-bottom tart pan coated with cooking spray. Trim excess crust using a sharp knife. Spoon sugar mixture into prepared crust. Bake at 350° for 45 minutes or until center is set. Cool completely on a wire rack. I used some leftover Cardamom Bread that I'd made instead of the Italian bread. It was delicious. Preheat the oven to 350 degrees F. Grease a 13" by 9" by 2" pan. Adapted from a recipe from Paula Deen of the Food Network. We had several rhubarb plants growing along the side of our house when I was growing up on Linden Hills Boulevard. My mom made this recipe frequently during the summer months. As with any fruit pie, serve it with a nice cheese -- such as aged cheddar. Our family saying is, "Pie without cheese is like a kiss without a squeeze." Mix together eggs and milk in a medium bowl. Mix together sugar, flour and nutmeg in a small bowl. Add egg/milk mixture and rhubarb. Pour mixture into prepared pie crust, and dot with butter chunks. Place top crust onto pie and crimp edges. Prick with a knife or fork several times in center of pie to allow steam to vent. Recipe courtesy of my mom, Sue Leighton. This dish is served at Lutsen Resort in Tofte, MN. The recipe was requested by a reader of the StarTribune, and Chef Jerry Swanson provided it to be published in the Taste section of the paper. Place cold water in a small bowl, and lightly sprinkle gelatin on top of the water. Allow to soften 1 minute. Do not stir. Combine cream and sugar in a small saucepan. Using a rubber spatula, blend gelatin mixture into cream mixture. Place over medium heat and bring to a low simmer, stirring. Remove from heat and cool slightly. Add sour cream, vanilla, and almond (if using). Blend until smooth. Pour into individual serving dishes and chill in refrigerator. This frosting is used on German Chocolate Cake. STIR milk, sugar, butter, egg yolks, and vanilla in large saucepan. Stirring constantly, cook on medium heat 12 minutes or until thickened and golden brown. Remove from heat. This classic recipe, also known as German Chocolate Cake, comes from the Baker's chocolate company. HEAT oven to 350°F. Line bottoms of 3 (9-inch) round cake pans with wax paper. MICROWAVE chocolate and water in large microwave-safe bowl on high 1-1/2 to 2 minutes or until chocolate is almost melted, stirring halfway through heating time. Stir until chocolate is completely melted. MIX flour, baking soda and salt; set aside. Beat butter and sugar in large bowl with electric mixer on medium speed until light and fluffy. Add egg yolks, one at a time, beating well after each addition. Stir in chocolate mixture and vanilla. Add flour mixture alternately with buttermilk, beating after each addition until smooth. BEAT egg whites in another large bowl with electric mixer on high speed until stiff peaks form. Gently stir into batter. Pour into prepared pans equally. BAKE 30 minutes or until cake springs back when lightly touched in center. Immediately run spatula between cakes and sides of pan. Cool 15 minutes; remove from pans. Remove wax paper. Cool completely on wire racks. Spread Coconut-Pecan Filling and Frosting between layers and over top of cake. Note: This delicate cake will have a flat slightly sugary top crust which tends to crack. This is a recipe that came from my grandma and is a family favorite. My uncle calls them "cocoa balls." I usually make a double batch because they are always popular on the cookie tray! Cream together butter, sugar and brown sugar. Stir in vanilla. Add flour. Stir in chocolate and nuts. Scoop a tablespoon of dough and squeeze it together until it forms a ball; repeat with remainder of dough. Bake on an ungreased cookie sheet for 15-18 minutes. Cool cookies. Roll in powdered sugar. I adapted this recipe from one that my friend Deb told me about. Crush cookies in food processor until quite fine; add nuts and process until finely chopped. With machine running, slowly pour Kahlua in until it reaches a consistency similar to peanut butter but a bit wetter. Add powdered sugar, ¼ cup at a time, processing until mixture cleans sides of bowl. Refrigerate until ready to use. Form into small balls, about one inch in diameter. Roll balls in additional finely ground Oreo cookie crumbs or powdered sugar. Alternately, the balls may be dipped in melted chocolate. Sift together the flour, ginger, baking soda, cinnamon, cloves, and salt in a bowl and set aside. In a large bowl, cream together the margarine and 1 cup sugar (on low speed if using a mixer) until light and fluffy. Beat in the egg. Stir in the water and molasses. Gradually stir the sifted ingredients into the molasses mixture. Shape dough into walnut sized balls, and roll them in the remaining 2 tablespoons of sugar. Place the cookies 2 inches apart onto an ungreased cookie sheet, and flatten slightly. This is my sister Amy's famous truffle recipe. It is surprisingly quick and easy. Feel free to substitute your favorite flavoring or liqueur for the framboise. Gently warm cream in a saucepan over medium heat, until small bubbles appear along edges. Place chocolate in a food processor; pour hot cream over it and allow to stand for 15sec. Then, process until smooth. Add flavoring and mix briefly. Pour into shallow pan, cover w/ plastic, chill until very firm (3 hours). Place cocoa into Ziploc bag. Form chocolate into 1” balls w/ hands. Drop into cocoa and roll to coat. Keep clean towel handy to wipe hands in between rolling. Store up to 2 weeks in refrigerator, covered. My mom used to make these scrumptious pecans when I was growing up. Put them in a decorative bowl and place on your coffee table when you have holiday gatherings; your guests will love them! Whisk together first 5 ingredients. Add pecans. Place on a sheet pan and bake for 30 min, stirring occasionally. Cool. Store in airtight container. Preheat oven to 350F degrees. Spread sugar in an 8-inch round baking dish; place in oven for 30-35 minutes or until sugar is melted. Cool for 10 min. Blend remaining ingredients in a blender until smooth. Pour into the round baking dish, over the melted sugar. Place the pan in a water bath, 1” deep. Bake for about 1 hour, or until a knife inserted into the custard comes out clean. Chill well. When ready to serve, run a spatula around the edge of the pan to loosen the flan. Invert onto a shallow serving dish. Thin caramel sauce will appear on top of the flan. My mom made this delicious pudding for me after I had surgery on my throat. It is soothing comfort food and felt great on my throat! Soak tapioca pearls in water for 30 minutes in a 1 1/2 quart saucepan. Add milk, salt and lightly beaten egg yolks to tapioca and stir over medium heat until boiling. Simmer uncovered over very low heat for 10-15 minutes, stirring often. Beat egg whites with sugar until soft peaks form. Fold about 3/4 cup of hot tapioca mixture into the egg whites, then gently fold mixture back into saucepan. Stir over low heat for about 3 minutes. Cool 15 minutes, and then add vanilla. Serve warm or chilled, plain or with nutmeg or coconut mixed in. Rosemary represents remembrance. So Martha Stewart's rosemary shortbread cookies are sure to make a lasting impression. Preheat oven to 300 degrees. Whisk flour, nuts, rosemary, and salt in a large bowl. Put butter and sugars into the bowl of an electric mixer fitted with the paddle attachment. Mix on medium speed until lightened, about 3 minutes. Mix in vanilla. Reduce speed to low. Add flour mixture; mix until dough comes together and is smooth, about 3 minutes. Turn out dough onto parchment paper, and pat into a round. Place parchment paper on top; roll into a 12-inch round, 1/4 inch thick. Transfer to a baking sheet; refrigerate until firm, about 30 minutes. Cut out cookies using various sizes of heart-shape cutters (1/2 inch to 3 inches); transfer to parchment-lined baking sheets. (Keep same-size cookies on same sheet.) Roll scraps; cut out. Gently press raw sugar onto edges of cookies. Bake until just golden, 15 to 18 minutes. Let cool on sheets on wire racks. Cookies can be stored in an airtight container at room temperature up to 5 days. Beat sugar and butter. Add eggs one at a time. Sift dry ingredients together, and then add to sugar / butter / egg mixture. Recipe courtesy of Deb Baker. Adapted from a Martha Stewart recipe. My good friend, Deb, gave me a loaf of this lovely Poppy Seed Bread. It is super easy and very delicious! Combine ingredients and divide evenly into 2 small greased loaf pans. Bake in a 350F degree oven for 45 minutes. Combine sugar and lemon juice, and pour over the bread. Poke holes in top of bread so glaze seeps in. I made this easy dessert for Easter supper at my sister's house. It was really good, not too heavy, and the almond flavor was very appropriate for the holiday. Grease an 8-inch round cake pan with vegetable spray. An alternative is to butter and flour the cake pan. In a medium bowl, whisk together the cornmeal, cake flour and baking powder and set aside. Using a stand mixer with a paddle attachment, beat the butter and almond paste on high speed until smooth, about 5 minutes. Reduce speed to low and slowly add confectioners' sugar. Mix until thoroughly combined and light and fluffy. Raise speed to high and add the vanilla extract, whole eggs and egg yolks, 1 at a time. Mix until well combined. Reduce speed to medium and add the sour cream and dry ingredients and mix until just incorporated. Pour the batter into the prepared cake pan and smooth the surface with a spatula. Bake in the lower third of the oven for 35 minutes, or until the cake is golden and pulls away from the sides of the pan. Transfer pan to a wire rack and let cool. 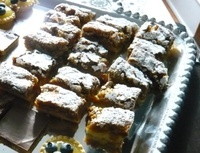 Remove from pan and dust with confectioners' sugar. This is an easy dessert that bakes while you eat dinner. Serve warm with whipped cream if desired. Place butter in a 1 1/2 quart casserole dish; place in oven to melt. Remove from oven and set aside. Meanwhile combine flour, sugar, salt, baking powder and cocoa powder in a medium bowl. Stir in milk and vanilla. Pour evenly into casserole dish. Combine sugar, brown sugar and cocoa powder in a separate small bowl. Add boiling water and whisk to combine. Pour this mixture over the other mixture in the casserole; do NOT stir. Bake uncovered for 40 minutes. This is my grandmother's recipe and a family favorite. I've been eating them for as long as I can remember. Cream butter using paddle attachment in stand mixer. Add vanilla and continue mixing. Add remaining ingredients and mix on low speed for several minutes until the sides of the bowl start to wipe clean and the mixture comes together. Roll dough in hands to form 1" balls. Place on baking sheet. Allow to cool slightly. Roll in powdered sugar when still warm. This is another recipe I learned to make in cooking school. Pre-heat oven to 350ºF (325ºF convection oven). Cream together butter, sugar and brown sugar on low speed, until no butter shows; scrape down bowl. Add next 3 ingredients and mix until combined (will not be smooth). Combine flour & baking soda in a separate bowl. Slowly add to creamed mixture, along with nuts, raisins and oatmeal. Mix only until combined – do not overmix. Drop cookies into equally sized mounds onto parchment paper lined sheet pans. Bake for 5 minutes, turn pans around, bake 3-5 minutes longer. This is the chocolate chip cookie recipe that I learned to make in culinary school. However, most people do not have high gluten flour at home! Therefore I recommend just following the recipe on the back of the bag of Tollhouse chocolate chips...it is simple, delicious and it never fails! Mixing: Creaming method. Cream together first 3 ingredients until no butter shows; scrape down as needed. Add next 2 ingredients and mix until it looks the same as before; scrape down. Add next 4 ingredients (that have been loosely combined first); mix only until combined. Add chocolate chips and mix for 2 minutes. Makeup: Drop method. Use portion scoop to drop onto parchment lined sheet pans (or greased cake pan for a cookie cake). Baking: 325ºF convection for 6 minutes, turn pans around, bake 4-6 minutes longer. My good friend, Catherine, called me for help in making peanut brittle; she was wondering what the "thread stage" meant. I pulled out my laptop and found that the thread stage is when a sugar solution has reached approximately 230F degrees; when a bit of the mixture is dropped into a glass of cold water it forms a long thread (as opposed to a mass). The glass of water trick may be used in lieu of a candy thermometer - you just need to know what to look for. Here is a great article with videos of what the various stages look like. Or, just use a thermometer if you prefer. Line sheet pan with parchment paper; set aside. Combine sugar and water in a heavy saucepan over medium heat. Stir until the sugar dissolves, about 5 minutes. Add the corn syrup and salt, and continue heating until it starts to boil. Place the candy thermometer in the saucepan, making sure the tip is not touching the bottom of the pan. Stir continuously while monitoring the temperature. When the mixture reaches 225F - 230F degrees (thread stage) stir in the peanuts. Continue heating and stirring until the mixture reaches 290F degrees (soft crack stage). Remove from heat. Add remaining ingredients (butter, peanut butter, salt and baking soda), stirring to combine. Pour mixture onto parchment lined sheet, spreading with a spatula. Allow to cool. I found this recipe in a dessert cookbook that I had gotten second-hand. I have never baked anything from this particular book and honestly forgot that I had it. However, there are a lot of wonderful, old-fashioned dessert recipes in it that are worth making. CAKE: Pre-heat oven to 350F degrees. Butter a 9"x13" pan; set aside. In a large, heavy saucepan over medium-high heat, combine the butter, water, honey, sugar, cinnamon, walnuts and salt. Cook, stirring, until the butter melts and the mixture comes just to a boil. Remove from heat. Sift together the flour, baking powder, and baking soda onto a sheet of waxed paper; stir the dry ingredients into the saucepan mixture. Pour everything into the prepared pan; smooth the top. 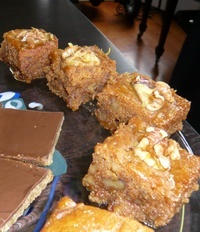 Arrange the walnut halves in even rows over the top of the cake. Bake until the cake is golden brown and a toothpick inserted in center emerges clean, usually 40-45 minutes. Cool the cake to lukewarm in the pan on a wire rack. SYRUP: While the cake is baking/cooling, combine the honey and water in a saucepan over medium-high heat. Add the lemon zest and bring the mixture to a boil. Simmer, stirring occasionally, until syrupy, about 5 minutes. Remove from the heat; stir in the lemon juice. While the cake is still warm, pour the syrup over it, a little at a time, letting it all sink in. Let the cake stand for at least 4 hours, or preferably overnight, before serving. Cut the cake into small squares or diamonds, with a walnut half in the center of each. This is our family's secret weapon when a quick, easy, delicious dessert is needed for a party or potluck. Cream together butter and sugar; add vanilla and egg yolk. Stir in flour. Press into 9"x13" pan (hint: use a large sheet of plastic wrap to push the mixture into the pan evenly). Remove from oven, and immediately place Hershey bars on top. Allow to sit for a minute or two, until melted. Spread evenly. Allow to cool completely and then cut into squares. Place dried apricots in a medium saucepan and add water to cover. Simmer for 10 minutes. Drain and allow to cool. Chop. Set aside. Mix butter, sugar and flour together. Press into 11"x15" pan. Bake crust until lightly browned (approximately 10-20 minutes; watch carefully). Cool. Beat eggs. Add brown sugar, mixing well. Add flour mixture, mixing to combine. Stir in vanilla, nuts, and chopped apricots. Bake 30 minutes in 350F degree oven. When cool, sift confectioners sugar over the top and cut into squares. Although flan is usually served chilled, this take on the classic dessert gets its delicate texture from cream cheese, and is best when eaten warm or at room temperature. This recipe tastes very similar to one that my mom makes. Heat sugar and water in a small heavy saucepan over medium-high heat, stirring until sugar is dissolved. Cook, without stirring, brushing down sugar crystals from side of pan using a pastry brush dipped in cold water and swirling pan occasionally so caramel browns evenly, until dark amber. Immediately pour into ramekins and swirl so caramel coats bottom of each and partway up side, then put in a roasting pan. Bring milk with cinnamon stick just to a simmer in a small heavy saucepan, then remove from heat and let steep, covered, 5 minutes. Remove cinnamon. Meanwhile, blend condensed milk and cream cheese in a food processor until smooth. Add eggs, vanilla, and salt and blend until smooth. Transfer to a large bowl, then whisk in hot milk. Divide among ramekins, then add enough boiling water to pan to reach halfway up sides of ramekins. Cover pan loosely with a sheet of foil and bake until custards are just set (they will still wobble slightly in center when tapped), 45 to 55 minutes. Cooks' note: Flan can be made 2 days ahead. Chill in ramekins, uncovered, until cool, then cover. Let stand at room temperature about 1 hour before serving. To serve warm, put ramekins in a roasting pan of hot water and straddle over 2 burners on low, then heat about 20 minutes.